The New Adventures of Gigantor! 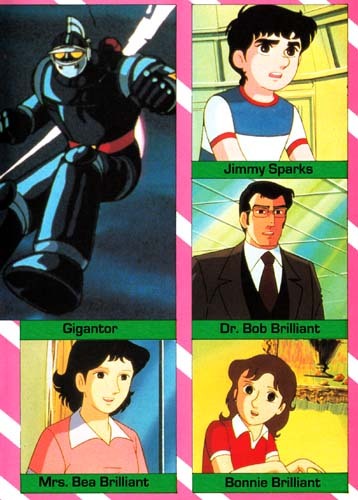 Sure, this 1980 remake of the popular 1963 boy-and-robot anime series (based on the Mitsuteru Yokoyama manga) didn’t make it to American TV until thirteen years after its Japanese premiere, and even then it ran in a weird time slot on a niche cable station best known for Twilight Zone marathons and later, a series of deliberately inane made-for-TV monster epics. And yeah, most anime fans ignored it; in 1993 they were binge-watching Ninja Scroll or Ranma ½ instead. Okay, so the company that released it has been bought and sold more times than I can count and the licensing rights are probably entangled in an unsolvable legal morass. But all these caveats can’t erase 51 episodes of clean, colorful, very TMS, very 1980s giant robot remake that doesn’t rest on its legacy, but instead takes off running and never stops. 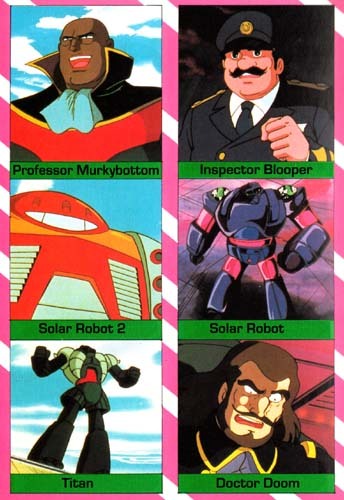 Part of a wave of color reboots that included Astro Boy and Cyborg 009, 1980’s Tetsujin 28 series is distinguished from the ’63-66 Tetsujin right from the show’s full title, which is Taiyo no Shisha Tetsujin nijuhachi-go, or "Solar Messenger Tetsujin-28". 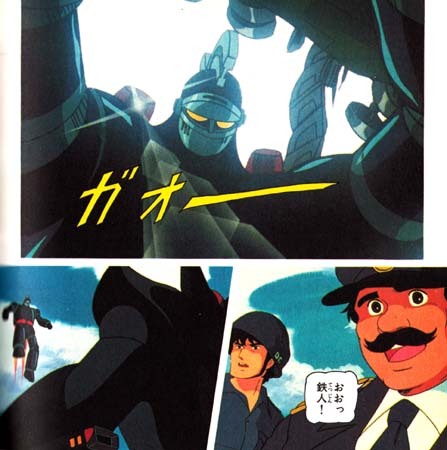 Originally the ’80 Tetsujin series was going to be a sequel, starring ’63 hero Shotaro’s son and featuring the first Tetsujin along with the updated model. This storyline was abandoned for the 1980 show, but would resurface in 1992’s Tetsujin-28 FX. Perhaps picking up on this fork not taken, original 60s Gigantor producer Fred Ladd brought over the 1980 Tetsujin series and merging the past with the (1980) present was exactly what he did. These New Adventures Of Gigantor explicitly link the new with the old, starting with a colorized clip of the ’63 series and including needle drops of the original 60s theme song mixing incongruously with the surprisingly jazzy Japanese soundtrack. Cable’s Sci-Fi Channel aired the show from Sept. ‘93 to June 1997 in a programming block known as "Cartoon Quest," remembered today mostly for having embarrassingly cheesy bumper segments. Viewers who made it past the bumpers were pleasantly entertained by the show's commitment to world-threatening giant robot action, and frequent use of animators like Yoshinori Kanada to liven things up in pursuit of said world-threatening giant robot action. The show is just as emblematic of its time period as the original black and white 60s series; while the 1963-66 show whizzed and bumped through its sepia-toned adventures with a whimsical mania, the 1980 series is smooth, colorful, well-designed, and filled with a sleek yet simple modernity that holds up 35 years later. Jimmy Sparks (Shotaro Kaneda), whose scientist father created 27 remote-controlled super robots along with Dr. Bob Brilliant (Dr. Shikishima) until finding success with #28, now looks a little less like a 50s advertising mascot and a little more like an actual tween. He’s old enough to pilot a giant robot, but young enough to not have to worry about pimples or embarrassing voice changes. 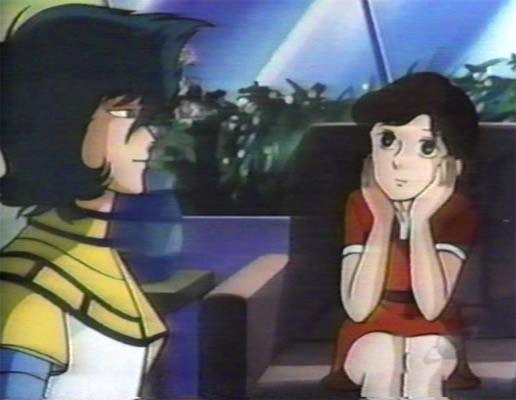 His companion throughout the show is Dr. Brillant’s daughter Bonnie (in Japan, Makiko Shikishma), a new character created just for the 1980 series. As always, the forces of law and order are represented by Inspector Blooper (Chief Ohtsuka) of the International Police, a goofy, mustached policeman with a beautiful wife and an upcoming role in the next TMS robot anime. 1980’s Gigantor launches from an underground hangar hidden beneath a tennis court, a sports-related note that brings to mind both Mazinger Z’s swimming pool egress and TMS’s successful shojo sports series Aim For The Ace. Jimmy’s natty blazer, tie, and short-shorts ensemble has been updated to a more casual short-sleeve high-collared IP shirt over a T-shirt. Relax; he’s still wearing shorts. And yes, Jimmy Sparks is still duly authorized to drive and carry a firearm. Let’s face it, you’re trusting a 12 year old to control a super robot capable of destroying cities; might as well let him drive. As in the original, different criminal gangs dress up in various uniforms and use super robots of varying types to carry out evil schemes involving theft, destruction, war, and other bad things. Recurring villain Professor Murkybottom is always after the secret of Gigantor’s solar energy converter, and even went as far as to kill Jimmy Sparks’ father in search of it. However, it isn’t long before the show moves beyond the original series’ 60s motif of evil villains, henchmen legions, and secret Bond-villain lairs. We might love the kitschy, clunky charms of the black and white show, but this version is a little more coherent. Gigantor faces Viking robots, Sphinx robots, space alien monsters, evil arms dealers, and monster Mediterranean octopi. There’s an episode involving the Guinness Book Of World Records, and a three-part Horror Thriller series involving robot ghosts, vampires, and zombies. Yes, there is a Kung-Fu Robo. The beautiful robot designer Marana visits from a different TMS show, maybe Cobra or Cat’s Eye, and makes two appearances to disturb Jimmy’s tween hormones AND use her super robot for crime. An amusement park roller coaster turns into a giant robot and kidnaps children. A robot King Kong wreaks havoc. The Jolly Roger pits his flying pirate ship against Gigantor. Murkybottom returns with a third, a fourth, a fifth, even a sixth super robot. The evil Doctor Doom hijacks bullet trains and threatens to send them into high-speed head-on collisions. 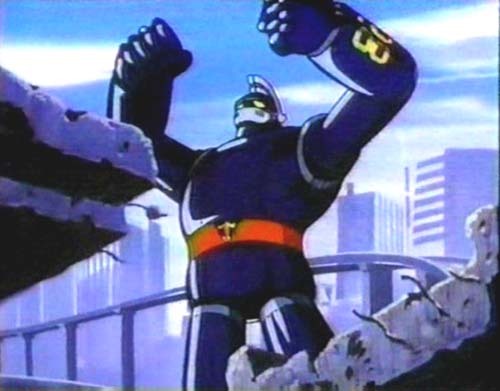 Professor Graybeard, whom viewers of “Giant Robo” may recognize as a certain Dr. Franken Von Vogler, creates Gigantor’s rival, the almost sentient Jackal (in Japan, “Black Ox”). Against these menaces Gigantor triumphs, usually using the Hammer Punch or his signature finishing move, the Flying Kick. 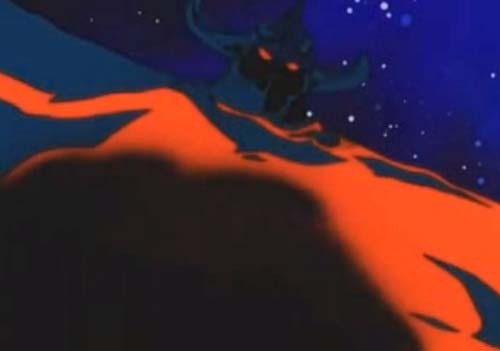 Halfway through the run, the show takes a left turn into outer space with the appearance of Modark, the alien overlord who is always referred to as The Evil Master Of Darkest Space. When his UFOs invade Earth and capture Prof. Murkybottom, an evil alliance is formed that will take our heroes into the void, wrestling Gigantor out of its robot crime roots and placing it firmly into Star Wars territory. Modark and Murkybottom together throw robots and space monsters and a cameo by vintage Gigantor foe “Brainy The Robot With The Dielectronic Brain” as Modarkian robot Antark against Sparks, Brilliant, Interpolice, and the Earth Defense Forces. Transformed into a far-flung space melodrama, the series pits Jimmy against Modark and forces Bonnie to cope with strange new feelings for the space prince Coldark. This hesitant outer space romance would blossom more fully in TMS’s next robot series, another Yokoyama adaptation about a young man’s super robot legacy, titled God Mars. 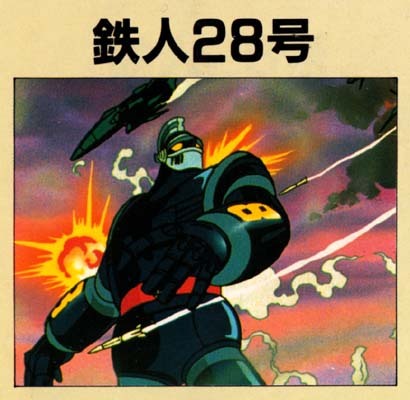 Like many anime shows neglected here, Tetsujin-28’s new adventures would prove more popular in Europe (“Iron Man 28” in Spanish and “Super Robot 28” in Italy) and in the Arabic-speaking world, under the title “Thunder Giant.” However, The New Adventures Of Gigantor was a tough sell for the American mid 90s kidvid market, being not kitschy or retro enough for baby-boomer appeal and not cutesy enough for actual kids. 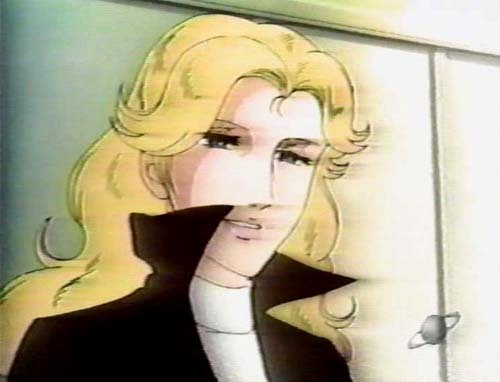 Anime fans accustomed to Robotech or Streamline’s more adult titles might have felt Gigantor lacked a certain sophistication, and after 1990s icons like Sailor Moon and Pokemon impacted North American popular culture, Jimmy Sparks and his space-age robot would become a footnote. 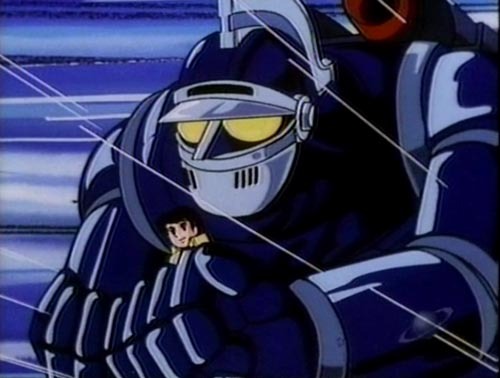 Contemporaneous anime fans eager for their throwback Yokoyama robot anime would find that itch more than scratched with the Giant Robo series of OVAs. Neglected at its airing, the series has never been released on home video in the United States, and that’s a shame. It’s a solid show that deserved more attention than anime fandom gave it at the time. Apart from the colorized 60s inserts, the localization is well-done and unobtrusive; violent scenes that might have been edited out a few years earlier are left intact. The competent and frequently snappy dub includes longtime industry veteran Richard Epcar and avoids the staccato Peter Fernandez direction of the original in favor of more naturalistic dialog. Mr. Ladd reports that the home video rights were held by LIVE Entertainment Inc., a production company formed out of the merger of home-video corporations Family Home Entertainment and International Video Entertainment, all under the corporate ownership of Carolco Pictures. According to Wikipedia, Carolco sold its shares in LIVE to Pioneer, which became Geneon, and which is now NBCUniversal Entertainment Japan. This tangled web of corporate ownership presents myriad complications to any potential English language release, the rights of which may involve one Japanese corporation and a completely different Japanese corporation both with a stake in an IP owned in part by the Mitsuteru Yokoyama estate. 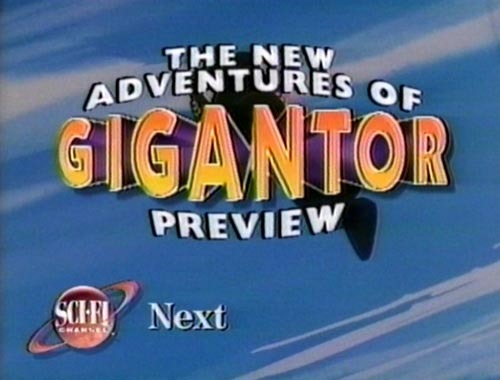 Merely locating watchable episodes of The New Adventures Of Gigantor is a nostalgic exercise in fan networking, a throwback to the tape-trading days of its original broadcast. If Let's Anime's referrals are any indication, the interest for this series is definitely out there. Who knows whether we’ll ever see this show in North American media again? Will it surface on a streaming video site, as its Japanese iteration currently is? Will some forward-thinking exec cut some red tape and release it on DVD? Perhaps Gigantor’s new adventures remain buried beneath a tennis court, waiting only for someone to take the remote controls in hand and command it to life. Thanks to Fred Ladd and Daniel Vucci for their assistance.